With the LOGOSOL PH365 you can produce complex profiles in one operation. 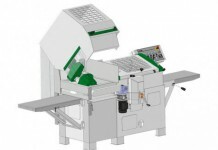 The five-cutter planer/molder is the large four-sided planer/molder PH360 that has been equipped with a unique fifth cutter. 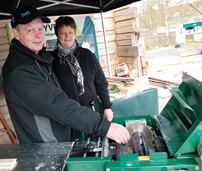 This combination gives you completely new possibilities when it comes to professional woodworking. As accessories, there is a wide range of tools available, such as brushes and sanding rollers for an extra fine surface finish. “LOGOSOL PH365 saves time and adds competitiveness to your business. 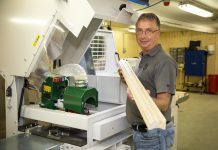 You can manage complex processing of all possible kinds of wood,” says Mattias Byström, Product Manager at LOGOSOL. 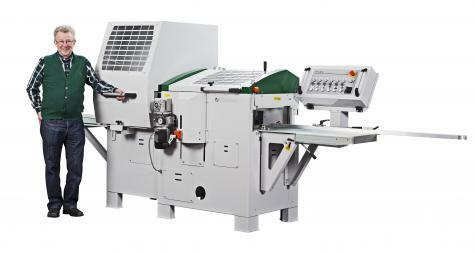 The additional cutter unit is developed from LOGOSOL’s vertical milling machine MF30. It differs from everything else on the market by being able to be tilted through 270 degrees. This means that you can machine the workpiece from below, from the side or from above. The machining is done with a conventional cutter with planing or molding knives or with a high-speed spindle for endmills. “You work efficiently with quick settings. With the PH365 you can produce elaborate products in one operation,” says Mattias Byström, and mentions material for window making as an example.